Me, circa 1961, during the first year of JFK’s presidency. 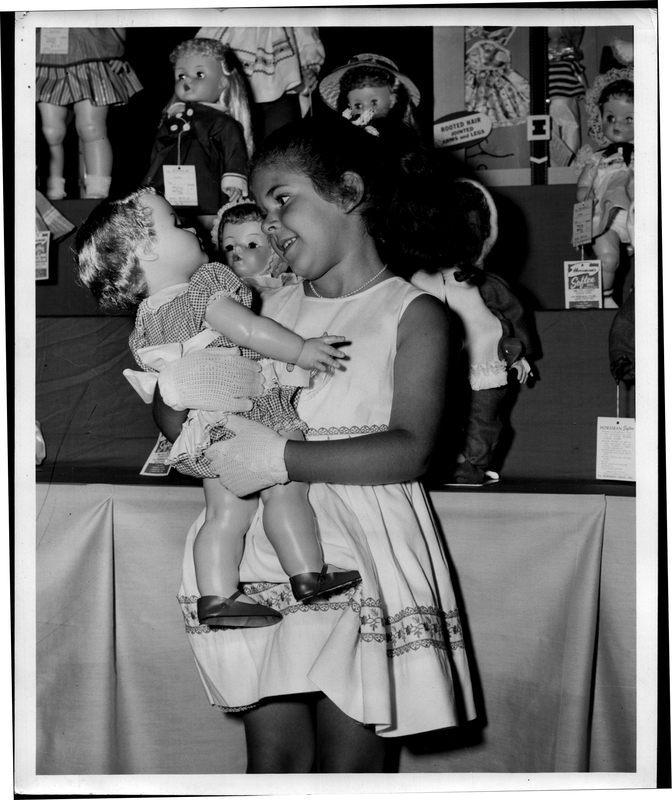 My father sold dolls in his hardware store (although not the Madame Alexander Caroline doll), and a highlight of the year was attending the Worthington Toy and Gift Show. After the initial gasps and cries of disbelief, the room became as quiet as the empty church across the alley. I don’t know with certainty that this happened, but I imagine our teacher, Miss Foreman, pulling out her rosary, quietly marking each bead with its designated prayer—the Our Father or the Hail Mary or the Glory Be. There’s no doubt in my memory about this, however; I clenched my hands together as tightly as I could and squeezed my eyes shut: this was the most important praying I had ever done before, and it had to count. So fierce was my prayerful concentration that I barely heard the P.A. system crackle back to life. Sister Mary Vaughan had returned to announce that the President had died. We were now to pray for his immortal soul. You could tell she had been crying, but she was trying to be brave for us. She was, in fact, the bravest person I knew. She once traded in her black habit for the cooler white one worn by the Sisters of Notre Dame when they served as missionaries in India. She spoke at assemblies in the cafeteria about the experience, asking us to contribute our pennies and dimes to the missions. There were rumors that she might leave St Mary’s at the end of the school year, possibly to return to India. I hoped it wasn’t true. She was the kindest of all the nuns and teachers at St. Mary’s, and I knew I would miss her just as much as I would miss President Kennedy. President Kennedy. He was dead, and I couldn’t really grasp what that meant. I had never known anyone who died before. Not that I actually knew him, but I did see him once in person, before he became president. This was a memory far more powerful than any television image, and there were certainly many of those to recall. It seemed as though he was on television all the time. It was three years ago, on Monday, September 27, 1960. I was four-years-old and, like most days spent in my father’s hardware store in Elyria, Ohio, I was coveting the dolls in the toy aisle, or scribbling with crayons on the large pads of paper that had “Supreme Hardware” printed in green letters on the top. On that particular day, crowds began to gather on either side of Middle Avenue. Senator John F. Kennedy’s presidential campaign motorcade route was to proceed right past the store, and my father wanted to make sure we were witness to history. He scooped me up, rushed us outside, and perched me on his shoulders so I’d have a good view. The man who was running for president waved to us from the convertible limousine—he waved to everyone on the sidelines—all of us cheering “JFK! JFK!” Someone tossed pretend straw hats into the crowd, and my father caught one. “WIN WITH KENNEDY” was stamped on the red, white, and blue headband. Then, just as quickly as the excitement peaked, the limousine drove north on Middle Avenue to take the Senator and his motorcade on to his next stop. I suddenly thought of Caroline. I was barely two years older than she; I couldn’t imagine that the pert little girl I thought of as a kindred spirit wouldn’t have a father anymore. After school let out, Mrs. Schaeffer, whose daughter was in my class, dropped me off at the corner of my street. When I reached our front sidewalk, I could see my mother, standing as she always did, preparing dinner at the dining room table. (Our kitchen was a small galley with hardly any counter space.) She was crying, and even though I knew that what happened that day was horrible, it still surprised me—and frightened me a little—to see my mother crying like that. The television was on; I’m almost positive that it was tuned to CBS and Walter Cronkite, because in my mother’s view, the fourth-most revered man in the world (after Pope Paul VI, President Kennedy, and Bishop Fulton J. Sheen), was Walter Cronkite. I don’t, however, remember seeing any of the coverage from that day. Did my mother think the reporting was too disturbing for me to hear? Was I too young to join her and my father in front of the set? Would she have turned it off and wait to get more news from the afternoon paper? Or wait until I had fallen asleep? I honestly don’t remember. The next television memory I have was generated a couple of days later. My parents and I had gathered at my Aunt Mary’s house on Pinewood Drive to watch the funeral procession on her new TV. We cried when we saw Caroline and John-John—especially when he saluted his father. The horse-drawn caisson (that word fascinates me still) making its long way through Washington—such a vastly different procession from the motorcade I had witnessed three years earlier—mesmerized me. My mother used to tell me that when I was little, if I liked a person, I would say “He (or she) gots a nice face.” I thought President Kennedy had a nice face. I loved his smile, and the way he looked right at us when he spoke to us on television, the way he grinned and waved from that convertible limousine on his swing through Elyria, Ohio. He was so handsome. Now he was gone, hidden inside the flag-draped coffin. My mother and I used to light votive candles in church as part of our prayers of intercession. I never gave much thought to the fact that the candle would eventually burn itself out, and a fresh new votive would replace it. It seemed to me that the act of lighting the candle was the important thing. But then the television cameras showed us where President Kennedy would be buried, in Arlington National Cemetery, and Walter Cronkite told us that an eternal flame would mark the President’s grave site. I imagined the largest votive candle in the world, one that would never burn itself out. Only one of them—the eternal flame—offered some measure of comfort. Click here to read other posts on this topic via Midlife Boulevard’s blog hop. This essay can also be found on the Huffington Post and in the Elyria Chronicle-Telegram. Thinking of that particular day and the week following will forever bring me to a place of sad tears. I was a senior in high school. The announcement came over the school speaker system while I was in Spanish class. We all sat in stunned silence. Then we learned he was dead. Our president had been shot and killed. Walter Cronkite, very emotional, made the announcement which was broadcast throughout our school. My teacher, a sturdy no-nonsense woman began crying. We all did. We were not just saddened; we were afraid I think. Afraid for our country. Sad at our own loss, but more sad for his family. We all seemed to identify with the young widow and her young children. Glued to the television over the next few days, my family and I shared the sad grief and fear of our nation. I think the image of John-John saluting his dad’s coffin will never leave my memory banks. Julie, thanks so much for sharing your story. It’s strange to remember, in our digital age, that there once was a time when nearly everyone in the country was experiencing the same broadcast…hearing news the same way. I agree with you about John-John…heartbreaking. Oh my goodness…Helen! A thousand thanks for your beautiful response to my essay. That you remember my parents so well fills me with joy…. Oh my gosh, Jim—you were in my class! So kind of you to take the time to read my essay and leave a note. Wonderful to hear from you. Thanks very much. Your memories are so similar to mine. i too could relate to Caroline because we’re the same age. What a powerful memory for you to have of him in the motorcade when you were four. What a sad day it is, remembering what was lost. Do you remember Caroline’s pony Macaroni? Such an innocent time, in so many ways…What we lost is incalculable. Thanks for taking a moment to read my post and leave a comment. You know, I’ve often thought about that, Laura. I think it might have something to do with having been an only child, and therefore more of an observer than an active participant in the day-to-day. If I wasn’t reading, I was keeping a watchful eye on the world around me. Really didn’t have many playmates when I was young. Your recollections of that time mirror mine, Marci. Although I have certainly thought about the assassination many times over the years, today as I read other posts I am awash in nostalgia. I loved reading yours. It rang so true for me. Thanks so much, Helene. I’m glad to hear it. I think of these blog posts as oral histories, in a way…our contributions to the historical record. How many of us will be left to remember 25 years from now? Or even 10? Truly amazing how we are all so connected by our very similar story. Yes it is. Perhaps one of the reasons (besides our sheer number) why our generation feels so vibrant. We all remember sitting in class hearing the dreadful news. Our generation carries the responsibility of connecting our history with the upcoming generation. Those of us who were in the early years of school have so many memories of assassination. The world was changing. Kennedy is woven through so many moments of our lives. Peace corps, lunar landing, allusions we use in our writing, he is there as a part of our educational foundation. That’s exactly right. The world changed that day; I think of the old metaphor “the iron curtain” as crashing down that day dividing the world into before and after. A subsequent generation will carry the pain of their own iron curtain dividing before and after: 9/11. Thanks very much for writing in. Thanks for sharing what it was like to hear the news as a child. I was too young to remember that the president was killed; I just remember that funeral cortege and sad parents. One of the things I’m reading over and over is the way school principals, but nuns in particular had to break that horrible news to kids. There must have been so many prayers going up that afternoon. Very cool that you actually got to see JFK as he drove by. I’ll never forget how I got to see him in person. Might be one reason why my memories of 11/22/63 remain so vivid. Thanks for taking the time to share your thoughts. Pingback: November 22, 1963 - What The Flicka?